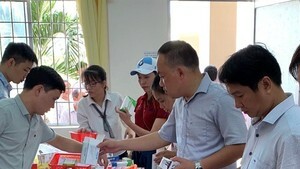 The People’s Committee of the southern province of Binh Phuoc said that since the beginning of the year, foot-mouth disease has hit cattle herds in districts Hon Quan, Chon Thanh, Loc Ninh, Bu Dang and Binh Long town. The outbreak occurred in breeder Tran Thi Le’s farm in village No.8 in Tan Hiep Commune. Additionally, of 782 cattle, 231 have contracted foot-mouth virus in Doc Qua village in Tan Hung Commune. Meantime, 73 cattle of breeder Doan Huu Duong in village No.1 in Doan Ket Commune in Bu Dang District have been tested positive for the disease virus. Worse, the virus was also found in a slaughterhouse in Loc Tan Commune in Loc Ninh District. So far, the provincial Agriculture Service Center and its sub-divisions have culled more than 300 diseased pigs and outbreaks had been under control.